Loader crane in bucket use. One vehicle doing two jobs - digging and transporting the masses. Parts of this crane have been designed and tested with the aid of our Datalogger, SM1, and our "know how" of evaluating the measurement data. 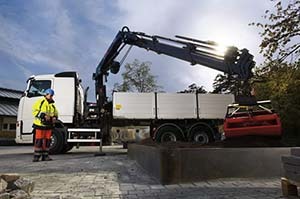 Swingotilt®, Rototilt, Tiltrotator etc… Yes, beloved children have many names, but the fact is that this hydraulic tool for excavators and backhoe loaders is more the rule than the exception these days on most of the machines at workplaces and construction sites around Scandinavia. Equipped with manuevers, cabling and connections from Infield instrument. 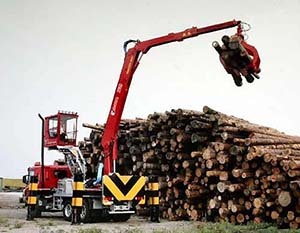 Timber crane in action. A Jonsered separete loader crane designed with the aid of our Datalogger, SM1, and our evaluationg services of the measurement data with respect to fatigue. The crane is also equipped with the Jonsered CE-box - a LMI (Load Moment Indicator ) - designed, programmed and built by us. 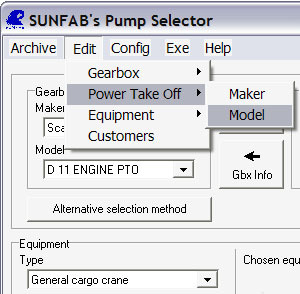 Infield developed the application "PumpSelector " that help Sunfab resellers and customers find the hydraulic components that work together with their existing equipment. 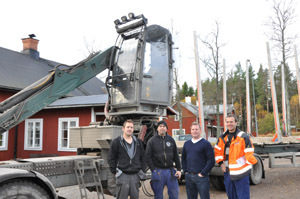 Our long experience from mobile hydraulics and environment eased a lot.